October 4, 2005: When you think of Leonardo Da Vinci, you probably think of the Mona Lisa or 16th-century submarines or, maybe, a certain suspenseful novel. That's old school. From now on, think of the Moon. You can see Earthshine whenever there's a crescent Moon on the horizon at sunset. Look between the horns of the crescent for a ghostly image of the full Moon. That's Earthshine. 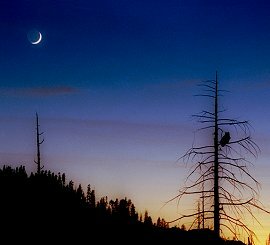 Right: A crescent moon with Earthshine over Yosemite National Park in October 2004. Photo credit: Andy Skinner. In 2005, post-Apollo, the answer must seem obvious. When the sun sets on the Moon, it gets dark--but not completely dark. There's still a source of light in the sky: Earth. Our own planet lights up the lunar night 50 times brighter than a full Moon, producing the ashen glow. In Leonardo's Codex Leicester, circa 1510, there is a page entitled "Of the Moon: No Solid Body is Lighter than Air." He states his belief that the Moon has an atmosphere and oceans. The Moon was a fine reflector of light, Leonardo believed, because it was covered with so much water. As for the "ghostly glow," he explained, that was due to sunlight bouncing off Earth's oceans and, in turn, hitting the Moon. First, the Moon has no oceans. When Apollo 11 astronauts landed at the Sea of Tranquility, they stepped out onto rock. Lunar "seas" are made of ancient hardened lava, not water. Second, Earth's oceans are not the primary source of Earthshine. Clouds are. Earth shines because it reflects sunlight, and clouds do most of the reflecting. 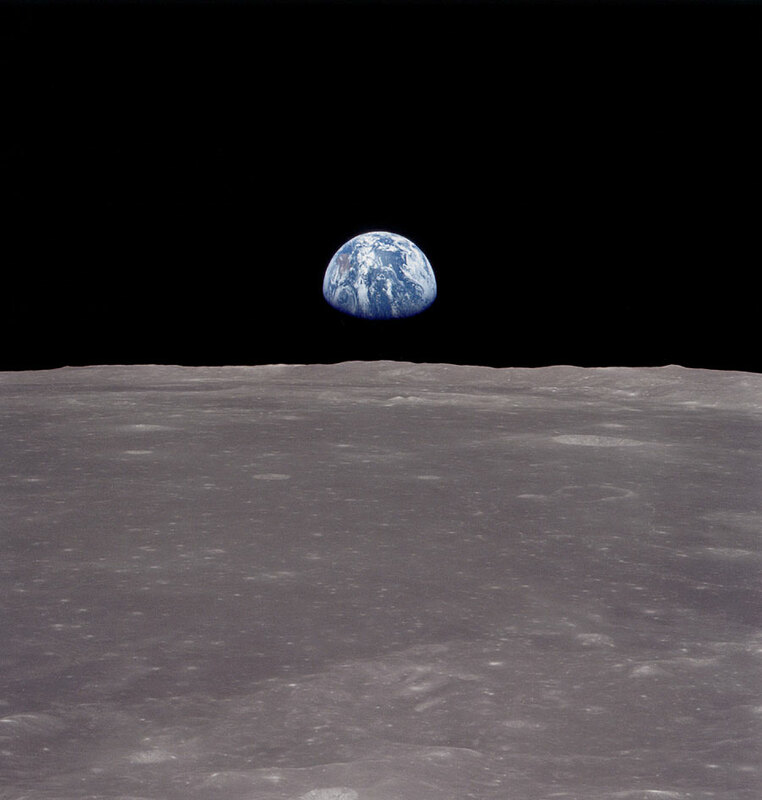 When Apollo astronauts looked at Earth, the oceans were dark and the clouds were bright. But these are quibbles. Leonardo understood the basics well enough. In the decades ahead, humans are going to travel in person where Leonardo's imagination went 500 years ago. NASA plans to send astronauts back to the Moon no later than the year 2018. Unlike Apollo astronauts, who stayed for a few days at most, these new explorers will remain on the Moon for weeks and months. In the process, they'll experience something Apollo astronauts never did: nightfall. A lunar "day" is 29.5 Earth-days long: about 15 Earth-days of light, followed by 15 Earth-days of darkness. Apollo astronauts always landed in daylight and took off again before sunset. Because of the bright sun, they never saw the soft glow of Earthshine at their feet. But the next generation of astronauts will. Leonardo Da Vinci's explanation of Earthshine -- (American Museum of Natural History) as it appears in Da Vinci's Codex Leicester, written between 1506 and 1510. Don't Gawk and Drive -- (Science@NASA) For reasons that are only beginning to be understood, Earthshine is brightest in April and May. Our planet's average reflectivity (albedo) is 0.297 plus or minus 0.005 according to Project Earthshine researchers. For more information see "Earthshine Observations of the Earth's Reflectance," by Goode et al, Geophysical Research Letters, Vol. 28, no. 9 (May 1, 2001), pages 1,671-1,674. Systematic observations of Earthshine can be used to monitor Earth's climate. The Real Da Vinci Code -- (Wired) modern engineers are reconstructing some of the fantastic devices in Da Vinci's notebooks, including "Leonardo's Robot."